The Daily Shaft: How bad is The Darkest Hour? I don’t want to be that guy who dwells on the previous year, but there was no way I was letting The Darkest Hour pass without comment. Perhaps it was the twelve year old single malt holiday cheer flowing through my blood stream, but the first commercial I saw for The Darkest Hour looked fascinating. People running from aliens in Moscow; what sci-fi/horror/survival fan wouldn’t perk up at that pitch? Two days later I saw another trailer that had Emile Hirsch wearing what looked like a low rent Soviet Navy take on Ghostbuster’s positron glider. That’s when I got suspicious. Unless the central characters are those nerds from The Big Bang Theory, there’s no way that your average person is going to have the physics or engineering know how to build an DIY energy weapon. Given that I couldn’t suspend my disbelief long enough to get through the trailer, I decided to see what some other critics had to say about this movie. The results are not encouraging. 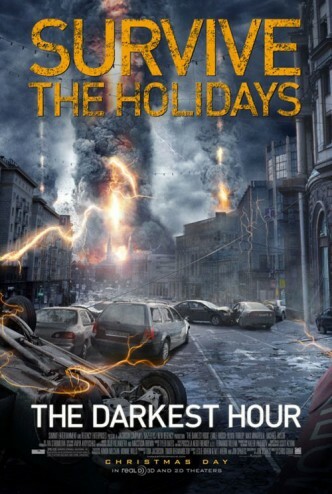 In fact, I think that The Darkest Hour is a dark horse candidate for worst sci-fi action movie of 2011, right up there with Battle LA or Skyline. Catsoulis also points out that The Darkest Hour’s screen writer, Jon Spaiths, is credited as one of the two writers for Ridley Scott’s upcoming Prometheus. Live in fear, boys and girls. I’m not usually one to ignore a movie because of its trailers or critical reviews, but in this case I think I’ll make an exception. Thirty seconds of this movie was more than enough to convince me that it’s not worth my time or money. Of course, if somebody wants to pay for my ticket I’ll gladly eviscerate or defend (high unlikely from the look of it) this movie. NB: Tomorrow’s post will be the 200th post to the Page of Reviews. Not quite sure what I’ll do for it, but I’m sure it will be something interesting. Good old Rabin. This looks dire… Godspeed you should you happy to go.